I am always surprised when people think that Mexican sauces are just different types of salsa. Actually, Mexican sauces can be complex and incredibly flavorful. If you’ve never tasted an authentic mole sauce, you owe it to yourself to seek one out. Full of rich smoked chile flavor and accented with Mexican chocolate, mole sauce is in a word “soulful.” That’s the good news. The bad news is that you need to plan a day or two to prepare it. When I am in the mood for Mexican flavor but don’t have lots of time, I make this far less time-consuming dish. It’s pretty simple to cook once you roast and peel the chilies and take the husks off of the fresh tomatillos. Remember that this dish can be as mild or hot as you like. For the mild version use the gentle Anaheim chile; for the hot version use the spicier poblano. If you are unable to find fresh chilies, the canned variety will do. Tomatillos are small, round, green and resemble large cherry tomatoes. They have an herbal, slightly tart flavor and are often used in sauces, soups and stews. Known as tomates verde, tomatillos are easy to clean and use. To remove the husks, hold the fruit under warm running water, peel off the husk and rinse off the sticky residue that coats the skin. When selecting tomatillos, look for firm, green fruit with unwrinkled husks. Remember that when the tomatillos are cooked they become sweeter and less acidic than when they are eaten raw. 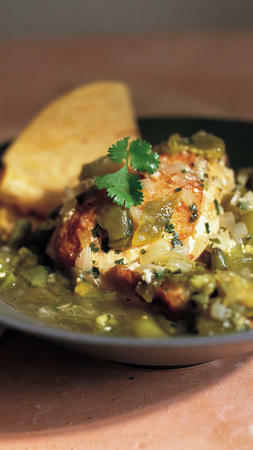 This chicken, fragrant with tomatillo, cumin and cilantro sauce, is a great dish for family and friends. Begin with a bowl of guacamole and fresh chips. Serve the chicken with vegetable rice and don’t forget warm corn or flour tortillas. I also like to serve Mexican beer with the chicken. 1. To peel the chiles, place on a broiler pan and broil approximately 6 inches from the heat until blackened on all sides. Use tongs to turn. Close tightly in a brown paper bag. Let rest for 10 minutes. Remove the chilies from the bag, drain and peel. Make a slit in each chile and open it up. Core, cut off the stem and scrape out the seeds and ribs. Chop the chilies into 1/4-inch pieces. Reserve. 2. Dry the chicken pieces carefully. In a large saute pan heat half of the oil over medium-high heat. Saute the chicken until lightly browned, about 3 to 5 minutes per side. You may have to do this in batches, adding the remaining oil as needed. Remove to a side platter. 3. Add the onion and saute over medium heat until soft but not brown, 3 to 5 minutes. Add the chicken stock and deglaze the pan by turning up the heat and scraping the brown bits off the bottom. 5. Transfer the chicken onto a serving platter and cover with aluminum foil to keep warm. 6. Add the lime juice to the pan and then reduce the sauce until slightly thickened. Add the salt and pepper. Taste for seasoning. Pour over the chicken pieces. 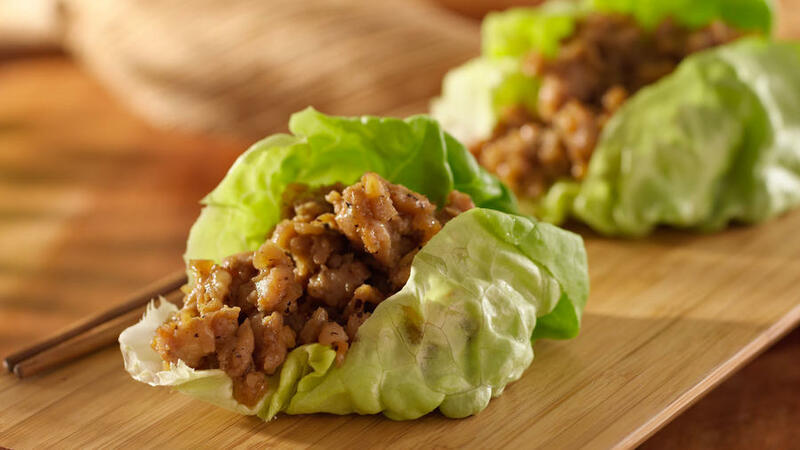 Serve with warm corn or flour tortillas and garnish with the fresh cilantro leaves. Growing up my mom would serve a large lunch after services that included simple roasted chicken with carrots and potatoes. It’s one of those taste memories that makes everything seem ok. While I loved that simple dish, I have elevated it with capers, olives and dried fruit to now become our family tradition. Know that this dish will fit in for any dinner party or holiday entrée, as well as Rosh Hashanah. Adapted from the Silver Palate’s Chicken Marbella, this sweet and savory chicken can be served hot right out of the oven, at room temperature, or chilled for a luncheon buffet. I’ve added black and green olives and dried apricots for a tangy twist. Make sure to use a roasting or jelly roll pan to catch any juices. Just make sure that the chicken is one layer so it can cook evenly. My friend uses a disposable aluminum roaster pan for easy clean up. You can easily double or triple the recipe for a crowd. I like to serve this with rice, farro or quinoa pilaf. Make sure to add some sautéed chopped leeks and carrots to the pilaf for a colorful presentation. Accompany with green beans for a complete main course. To drink? The versatility of this dish gives you flexibility of a wine choice. Aromatic whites such as Viognier or Sauvignon Blanc mirror the recipe’s herbs and fruit. A Syrah or Zinfandel would also be delicious. It’s hard to make a mistake with this wine pairing! To make the marinade, in a bowl, stir together the garlic, oregano, salt and pepper to taste, vinegar, oil, leek, apricots, plumes, olives, and capers until blended. Place the chicken in a large lock-top plastic bag and pour in the marinade. Turn the chicken in the bag to coat them evenly. Seal the bag and refrigerate for 2 hours or up to overnight. Preheat the oven to 425°F. Place the chicken in baking pans in a single layer, skin side down. Arrange the marinade ingredients around the chicken. In a small bowl, dissolve the brown sugar in the wine, stirring to blend. Pour half over the chicken. Roast the chicken for 20 minutes. Remove the chicken from the oven and turn chicken skin side up with tongs. Pour over the remaining wine and roast for another 25 minutes, basting once, or until the chicken is nicely browned and cooked through, and no pink color remains. 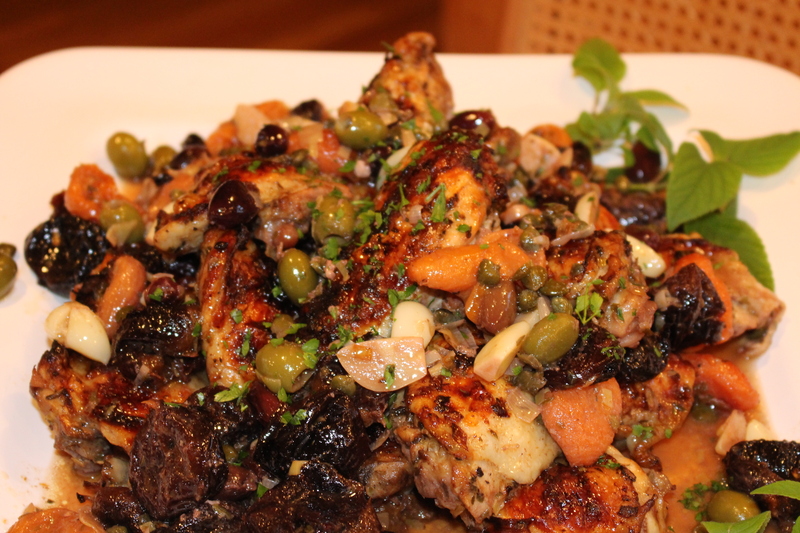 To serve, arrange the chicken pieces with the fruit and olives on a platter and top with some of the pan juices. Garnish with the parsley or cilantro and serve immediately. Advance Preparation: Make up to 1 day ahead through step 1, cover, and refrigerate. Or make 1 day ahead and serve cold or at room temperature. Valentines Day is one of the busiest nights of the year for restaurants. For me, it is a time to enjoy a lovely meal at home with good friends. I can’t think of a better dish to serve than crispy duck breasts. Easy to prepare for a novice cook, duck breasts are the best combination of a crispy duckling and the meatiness of a good steak. Cooking duck breasts used to intimidate me. I am not sure why but I am glad I finally tried cooking them. The key to their crisp skin is letting the skin dry out overnight in the refrigerator. 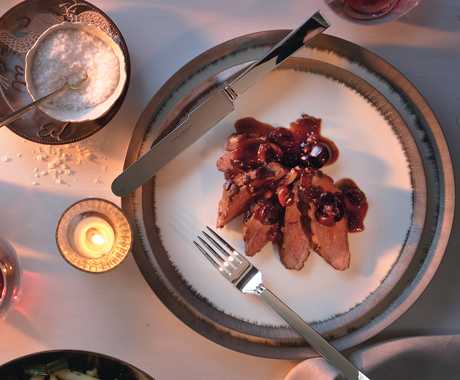 Quick to put together and much less messy than roasting a whole duck, duck breasts are a perfect main course for a small dinner party. You can gather in the kitchen as you cook them up. This will serve 4 to 6 depending upon how large the duck breasts are and how big your guest’s appetites are. If you just want dinner for two, you can halve the amount of duck breasts, but I would make the whole sauce amount in this recipe. If you’re wondering why, my philosophy is you can never have too much sauce! Try to find fresh duck breasts because the frozen variety tend to become rubbery. Muscovy or Hudson Valley ducks are preferred. For Valentines dinner pair the duck with herbed rice or orzo pasta. The sweet red cherry sauce is a vibrant contrast to the crispy brown skin. Bright green broccoli spears completes the menu. I vote for an Oregon Pinot Noir to drink. For dessert, anything chocolate, of course, and maybe a Late Harvest Dessert wine to cap off the evening with sweet thoughts. Heat 2 tablespoons butter in a large skillet, large enough to fit the four halves, on medium-high. Sauté the duck breasts, skin side down for about 5-7 minutes or until the skin is very crisp and nicely browned. Turn over and sauté for another 5 minutes or until the duck breasts are medium rare. Remove and place on a wood carving platter and loosely cover. (If you prefer medium, cook another 2 minutes on the second side). Let rest for 5 to 10 minutes. Remove all but 2 tablespoons of the drippings and sauté the shallots for a minute or until softened, stirring the brown bits up. Add the stock, honey, port and cherries and increase the heat to high. Reduce the mixture to a light glaze, about 3 minutes. Whisk in the 1 ½ tablespoons butter to thicken and add sheen to the sauce. Season to taste with salt and pepper.